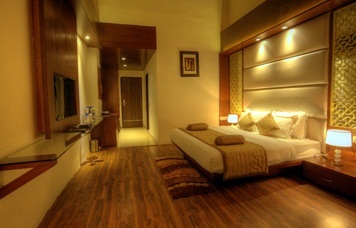 Deluxe Rooms: Deluxe Rooms at Shimla Havens Resort have 275 square-feet of deluxe accommodation with incredible views of the thick deodar forest and wide open valley from large window, superior furnishings with burnt wood effect at the back wall with the wooden panelling and amenities that provide guests with everything they could ever want and more. 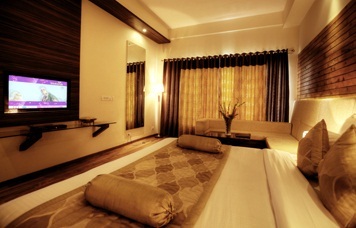 The Deluxe rooms have king sized beds with sitting area. 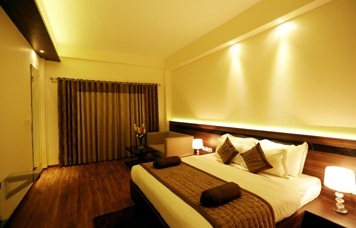 Broadband Internet access and WiFi, Tea/Coffee maker in each room, advanced telephone system, In room safe deposit box, 32″ LCD TV with satellite channels to watch.